When it comes to comfort food, tomato soup definitely hits all the right spots. Call it the ultimate kid food, but the mild, sweet taste of tomatoes is inviting and incredibly soothing. All sorts of memories come to mind with tomato soup. On rainy or snowy days warming tomato soup will take away any chill. Of course, the natural accompaniment would have to be a good ole grilled cheese sandwich. 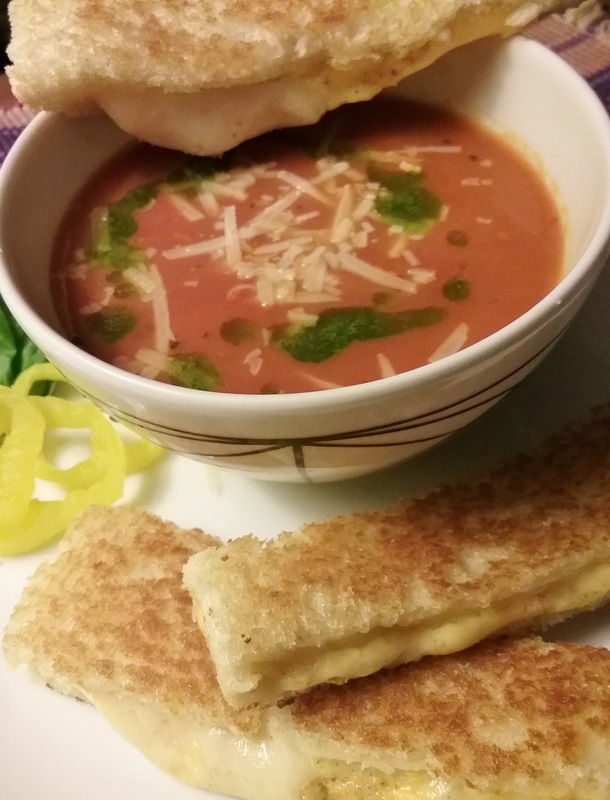 What’s not to love about dipping a gooey toasted American cheese sandwich into a steamy cup of tomato soup? Recently, I made a big pot of soup for an event that would have to hold for 2 to 3 hours. Of course the Joy of Cooking has the right idea. Make a tomato base and add a white sauce for serious holding power. It worked like a charm. It did not break down and stayed thick and creamy for the duration. So if you are looking for a little comfort food, this one is for you! P.S. Coming up: a no-recipe-required grilled cheese sandwich as a bonus for anyone who needs one. 1. Sauté the oil, onion, carrot, garlic and basil until soft. Add the tomatoes and simmer 20 minutes, thinning as needed with about 1 cup stock or water. Adjust seasoning with lemon juice, salt, and pepper. 2. Meanwhile, make White Sauce: in sauce pan, melt butter over low heat. Add flour and blend 3-4 minutes until cooked and smooth. Slowly whisk in 1 cup stock to eliminate lumps. Stir and simmer until thick and smooth. Add the condensed milk to the tomatoes and heat well. Season with salt, nutmeg and white pepper. 3. Puree the tomato base in blender or with an immersion blender, thin as needed with more stock or water and return to pot. Strain the white sauce into hot soup and heat well. Simmer on low heat for 5 to 10 minutes to blend flavors. Adjust seasoning. Serve with grated Parmesan cheese, fresh basil or a drizzle of Basil Oil. Serves 8. Blanch the leaves in boiling water for 10 seconds. Remove to cold water bath with slotted spoon. Remove and blot, squeeze out water. Blend with olive oil and season with salt to taste, strain if desired. Store in fridge. Yield: 1/2 cup. We all have our comfort foods. When nothing else sounds good, we reach for familiar touchstones to soothe us. They many not mean much to anyone else, but we have our favorites. Years ago I wrote a heritage cookbook for my family with the odd title, What Sounds Good? It was just that, a crazy assortment of cherished recipes that were a regular part of our food repertoire when my daughters were growing up. At our house, there was always a debate underway about what to eat for the next meal or upcoming food event. The discussion would typically include what sounds good? Some of the recipes in What Sounds Good? were from my own childhood; some I picked up in my early days of cooking from friends and family. Some were regional, like Santa Maria Style Beans and Boston Clam Chowder. They still hold a place in my heart. Yesterday was one of those days. It was cold and rainy and I was feeling the aftermath of the long Thanksgiving weekend. I needed something that reached down and warmed my soul. Of course, it was no further away than my pantry shelves. 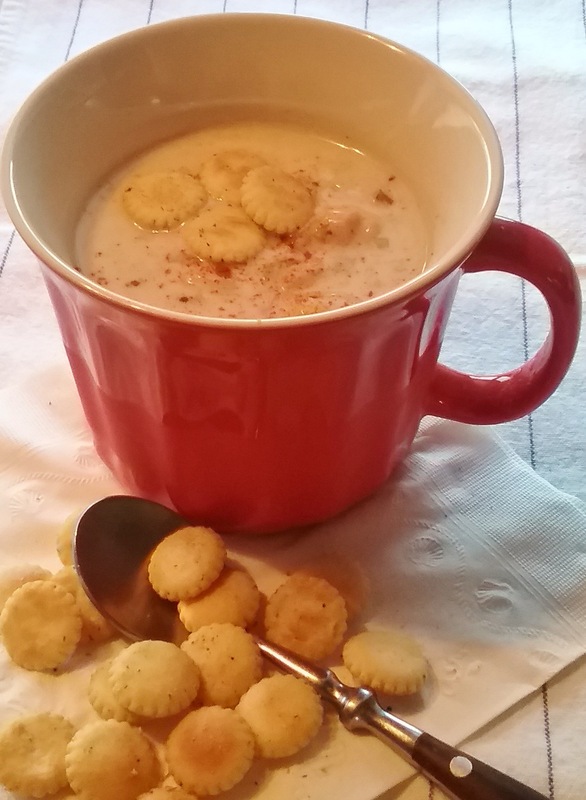 I always have the makings for clam chowder tucked away somewhere. I pulled out my soup pot and found a familiar rhythm. The smoky scent of bacon always perks me up. 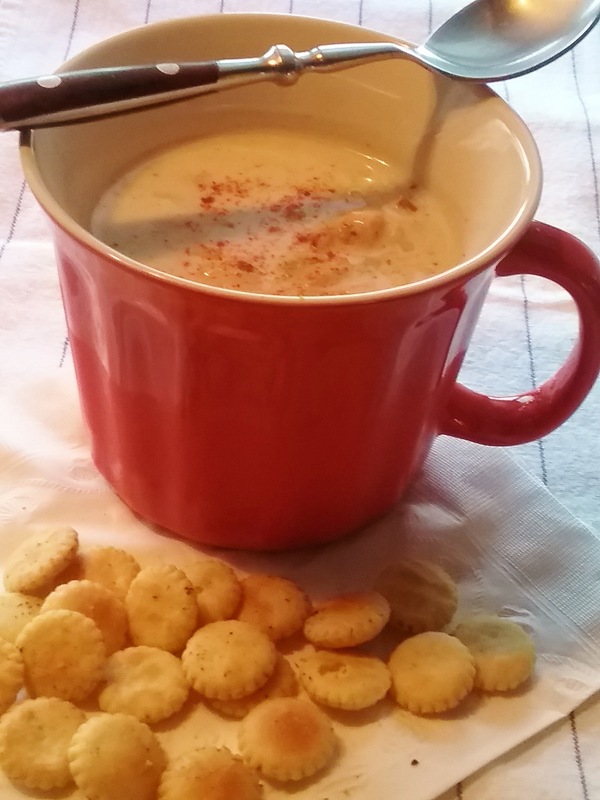 There’s nothing fussing here: some onion, potato, a bit of celery, a few herbs… In no time I had hearty soup cups ladled full of thick and creamy clam chowder. Funny thing. This morning I pulled out the recipe to take a look at it. It has been a while since I made it, and without thinking, I made it as written in the cookbook, down to ingredients and quantities. I guess somethings are too good to change. In a soup pot, sauté the bacon over medium heat until it begins to color. Drain off all but 1-2 tablespoon of the fat. Add the onion, and cook to soften, then add the celery and toss briefly. Add the potato, herbs, white pepper. clam liquids, and enough additional water to barely cover the potatoes. Bring to a boil, cover, reduce heat to a simmer, and cook until potatoes are tender, 10 to 15 minutes. Combine the flour and water into a slurry and slowly stir into the potato base and allow it to thicken. Stir in the milk and clams and heat well, but do not boil. Adjust seasoning. Serve with garnish of choice. Serves 4.